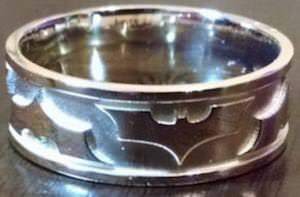 Now there is this nice Silver Batman Ring that almost looks like a wedding band. So if you know a Batman fan you want to put a ring on then this ring could be what you need. This Batman ring is made from sterling silver and comes in a huge range of sizes and you can even get it engraved when you order one. The band has an edge on the top and bottom and in the middle, you can see the bat symbol neatly placed in a row. If you are a Batman fan that loves to show people around you then now you can every day as you just have to wear your jewelry. Now fans of Negan can be wearing this Lucille Bracelet. If you watch The Walking Dead then you know who Lucille is and that Negan named his bat after her and now there is this bracelet that looks like a bat complete with the barbwire on one end and the name Lucille engraved in it. 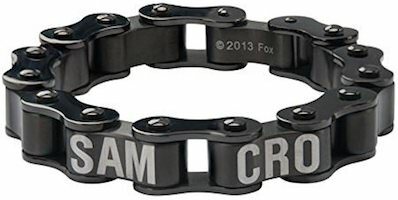 The Walking Dead bracelet is made from zinc alloy and can be that piece of fan jewelry you want to own as it is so special and also shows everyone around you that you are Negan. Come check out this The Walking Dead jewelry as it is great for yourself or as a present. 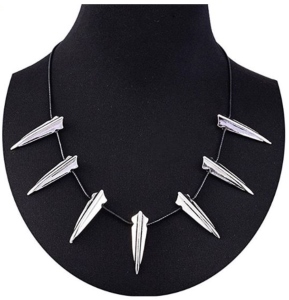 If you love Marvel Comics and enjoy the Superhero of Black Panther then this is a must have piece of jewelry for you to add to your collection and show off. The black Panther pendant necklace features 7 stainless steel spikes each detailed and look amazing fastened to an all black leather cord very high quality and has a clasp to clip it together. Each pendant measures about 1.97 inches in length and the leather cord chain measures 23 inches in total. The Black Panther pendant necklace is great to ad to a Halloween costume or wear as an everyday necklace for all occasions. Now you can have Venom wrapped around your fingers all thanks to this Venom mouth ring. 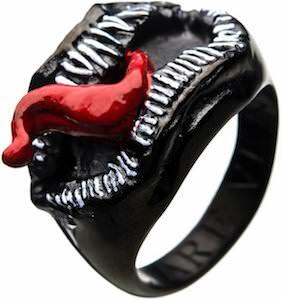 The black Venom ring has the mouth with sharp white teeth and his long red tongue on top. On the inside of the Marvel ring it says “We Are Venom” which almost gives you superhero powers. You can get this Venom ring in sizes 9 – 12 and it makes for a nice present for a fan of Venom and to make it the perfect present they put this ring in a nice Venom jewelry box that has a window so that it also is a cool display box of your special Venom jewelry. Disney fans look no further here is an amazing pair of earrings based after Minnie Mouse. The Minnie Mouse earrings feature a stud style in the shape of Minnie with her bow. 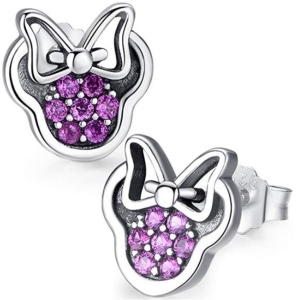 Using high quality white cubic zirconia stones that are soft purple in color and really sparkle and shine. Wearing these Minnie earrings will make any Disney fan jealous with envy towards your hot new jewelry. All Minnie Mouse earrings come in a collectors jewelry box perfect to display and keep your earring safe. If you like Winnie the Pooh and want some fun jewelry then you should check out these cute Winnie the Pooh earrings. These Disney earrings do not require you to have a whole in your ear as they are clip on earrings. 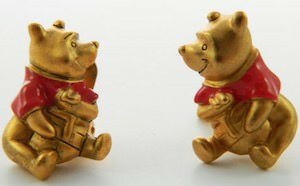 The Winnie the Pooh earrings are made from gold tone metal with red enamel because Winnie has a red shirt. And as you can see on the picture these earrings show Winnie the Pooh holding a big pot of honey because that is what this cute bear likes to eat. 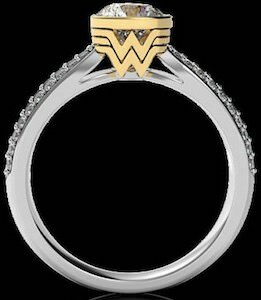 If you want to propose to the Wonder Woman in your life then you have to check out this Wonder Woman engagement ring. This ring is not just one ring but one that you can configure so that it is perfect for your future wife. The ring has a crown that is gold with the Wonder Woman logo on the side and then you can choose to have silver or gold ring and you can even choose the stones you like, just pick one of the many options, it could be gemstones but also diamonds and many other options. You can even pick to have stones on the ring or having a more open version. You just have to see more images of all the options and you can see them by clicking on the picture. Now you can start preparing the proposal after you made the ring you like best in the perfect ring size. 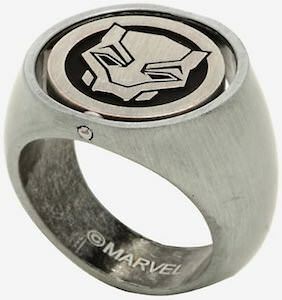 If you need some cool jewelry and you like Black Panther then you should check out this Marvel Black Panther ring. The metal ring is a cool men’s ring in ring size 10 and has a cool center that looks like the mask of Black Panther and to make this ring even cooler then you are in luck as you can turn the center and then it shows the Black Panther logo. So not only can you have a cool ring on your fingers you can keep playing with it all day to as the turning center is just fun and changes the look on your fingers.